Figure 1: cytology from the abdominal mass. A cluster of cells demonstrating mitoses and multinucleation. A CT scan of the dog’s thorax and abdomen characterised the extent of the mass and also revealed that the dog mad marked lymphadenomegaly of the sternal, cranial mediastinal, aortic and hepatic lymph nodes. 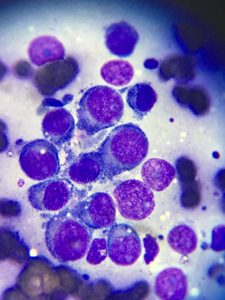 An important differential diagnosis for both the clinical presentation and the cytologic findings would be high-grade lymphoma, or less commonly, disseminated histiocytic sarcoma. The course of these diseases would be expected to be rapid, and the mainstay of treatment would be medical. In this case however, our dog had a very different diagnosis. The clue was to be found in the tumour’s vascular supply and anatomic attachment. A contrast CT scan clearly showed the gonadal artery coursing through the mass, which was itself continuous with the dog’s left ovary. This is consistent with an ovarian tumour, and given the cytology being suggestive of a poorly-differentiated round cell tumour, differential diagnoses of a dysgerminoma or a teratoma (rather than a carcinoma) were considered likely. 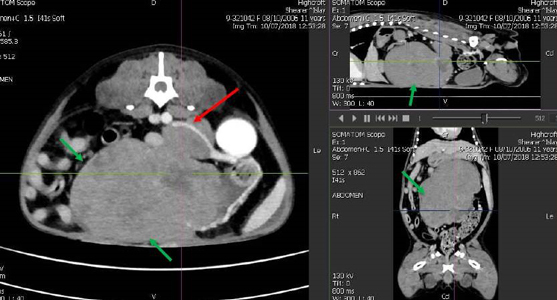 Figure 2 shows the CT scan of the abdominal mass where the green arrows indicate the mass and the red arrow indicates the gonadal artery. 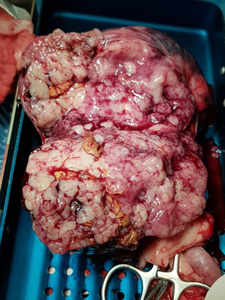 Cytology from the dog’s enlarged sternal lymph node subsequently confirmed that it was effaced by the same cell population as the abdominal mass; the tumour was clearly metastatic. 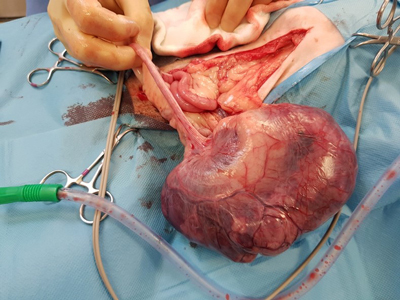 Since both the differential diagnoses are considered slowly-progressive, and the dog was showing clinical signs relating to the mass, a decision to surgically-excise the abdominal mass was made in the interest of improving the dog’s comfort. Soft tissue surgeon Ivan Doran took the dog to surgery. The mass was clearly demonstrated tobe an ovarian tumour. Histopathology later confirmed the mass to be a dysgerminoma. Figure 3: the heterogenous interior of the tumour after sectioning. Ovarian dysgerminomas are rare canine malignancies, characterised by slow-progression and a low metastatic rate (in the order of 10-20%). Many dogs survive over 18-months post diagnosis. 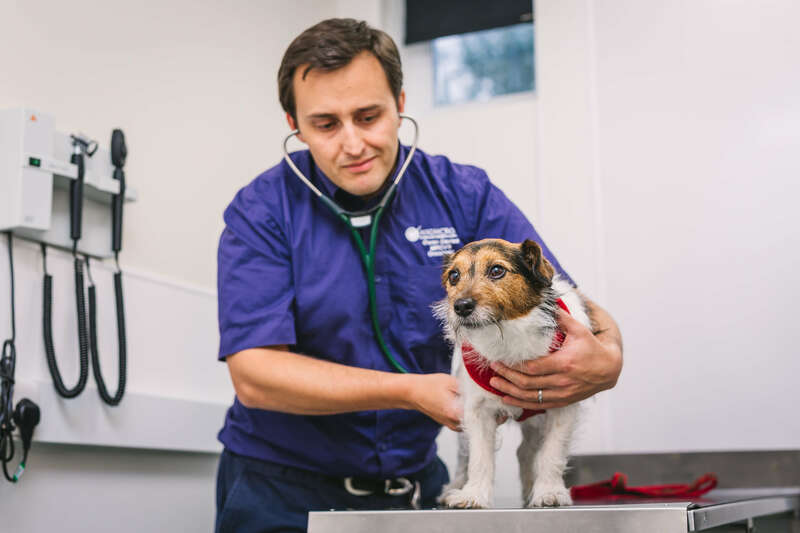 Owing to their rarity, there is no consensus for the most effective medical therapy in cases which are metastatic, but platinum-based drugs are the standard-of-care in human medicine and so these treatments can be extrapolated to dogs. The dog recovered well from surgery, and has rapidly returned to her usual active lifestyle. A course of carboplatin-based chemotherapy has been advised to control development of further metastatic disease, and is hopefully starting soon. 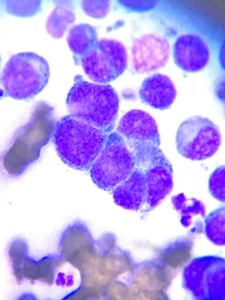 A dog with circulating “atypical” lymphocytes; Is it a lymphoma or a leukaemia?